Build a healthy, natural sunless tan over time with this self tanning cream. 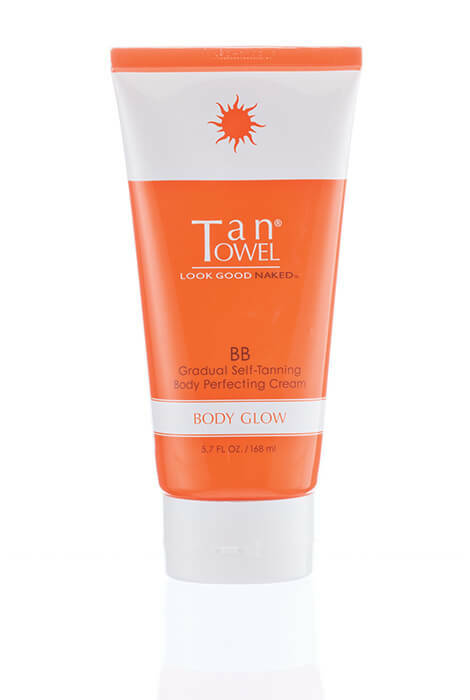 TanTowel® Body Glow BB Gradual Self-Tanning Body Cream evens skin tone and develops a gorgeous golden glow with daily use. The nourishing formula instantly hydrates, brightens and illuminates. For best results, use daily as your body moisturizer. Apply evenly on skin surface and allow to dry prior to dressing. Wash hands immediately after applying. Wash hands immediately after applying. Water, Cetearyl Alcohol, Glycerin, Isopropyl Myristate, Butyrospermum Parkii (Shea) Butter, Dihydroxyacetone, Ceteareth-20, Petrolatum, Dimethicone, Hydroxyethyl Acrylate/Sodium Acryloyl Dimethyl Taurate Copolymer, Steareth-2, Aluminum Starch Octenylsuccinate, Erythrulose, Cetyl Esters, Mineral Oil, Phenoxyethanol, Sodium Benzoate, Potassium Sorbate, Fragrance, Caramel, Red 40.